Ah Turkeys. Those lovely creatures that arrive small and fuzzy... and grow to leave you with little doubt they descended from velociraptors. At least they're tastey, right? Well, this morning, I took 6 of the Broad Breasted Whites as well as 6 of my older hens to King's Poultry outside of Bradford for processing. I know we (me plus 3 others) managed to process all the turkeys last year, but something along the lines of insanity struck when I doubled the number of birds I was raising. With everything else going on, having someone else spend the time and deal with the mess of processing the turkeys is fine by me. I've heard good things about King's so off they went. ﻿Of course Hurricane Sandy was in full force as I was driving the Explorer with the small trailer complete with homemade side walls and dog and rabbit crates with birds in them an hour north. But we arrived in one piece and I dropped all the birds off. I'll be heading back of that way in a few hours to pick them up. I'm looking forward to seeing what the birds weigh. Remember that BBWs are considered butcher-ready at 4 months. I purchased these the week before Memorial Day. Do the math and they're currently a full 5 months. And after carrying them, they're definitely BIG birds. I'll be happy to have them gone, not only to preserve my poor fingers but also my wallet as they were eating a TON in the last few weeks. This was kind of the trial run. The rest of the turkeys are scheduled to go up on November 17th... perfect timing for Thanksgiving. I'm still on cloud 9 from Noble's performance at the Come Again Farm Fall Horse Trial & Dressage Show. He has made amazing progress with everything since Anita and I have been working with him. He's a great horse. My bubble of happiness was only slightly burst when I saw the pictures the professional photographer had taken of us. Unfortunately, due to when I rode, there are no dressage pictures... so no evidence of the buck or of the overall lovely test. And I wish there were more cross country pictures. Our XC ride felt lovely and forward and definitely more solid than SJ had been. More pictures showing proof of that would have balanced out the overall icky pictures from SJ that proved just how rocky that phase had been. The next entry is filled out and will go in the mail later today. 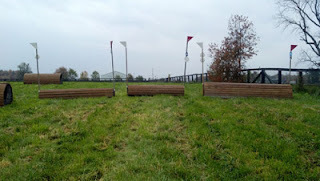 Walnut Creek Pony Club Mini Trial on November 4th. Moving up to Beginner Novice! I was initially hesitant about it, but I know he is more than capable and is currently working on some bigger fences at home. I'll continue to work on the me part as well and I'm sure we'll have a great time. In other news, the girls are doing great. Shirley had her first ground driving session with Anita last night and did REALLY well. She'd make a GORGEOUS carriage horse! 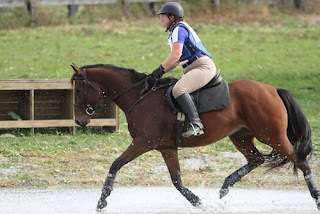 Spi did a bit more with me under saddle. Working on getting her to relax a bit more, but she's coming along very nicely. Me however... I'm sick. Literally. Stuffy head, sneezing. Am signed up to do the Ghosts & Goblins 5K tonight downtown and am still hoping to make it. If I do, there will definitely be more walking than running, but we'll see how I feel come that time. Too much going on to be sick. I also think I found a butcher for the turkeys. YAY!! Spider and Shirley (the girls) are doing great! They've passed what we jokingly refer to as "Cow 101". In fact, now I have to make sure I feed in the correct timeframe or the girls try to go push the cows aside and eat their grain too! With some decent weather, the pasture has dried up from recent rains and we've taken the opportunity to put the girls to work. Shirley, being a bit greener than Spi, is currently only working on the lunge. 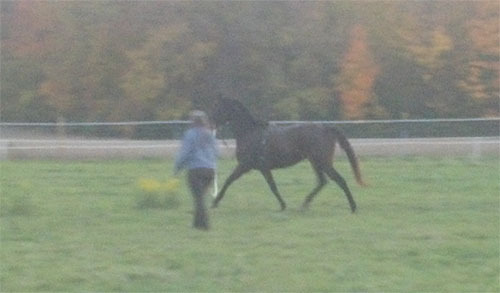 She's doing wonderfully well however, walk/trot/canter both directions in side reins. It won't be long now before we feel she's ready for us to hop on and continue her education under saddle. Anita with Shirley on the lunge line. Spider is already there and we've had 3 lovely rides this week. No canter work under saddle yet, although I cantered her on the trails last month. It's not that she can't, it's more than we're taking their education slow and thoughtful in its progress. First is getting relaxed work at the walk and trot. Both girls are very soft mouthed and acceptance of the bit is a priority. The last 2 days, we did trot Spi through a ground pole grid... pole, 4'6", pole, 4'6", pole, 9', pole, 18', pole. Last night we did raise the final pole to approximately 12" (it was resting on 2 overturned buckets while we await jump cups to arrive). Spi is doing fantastic and we'll probably stick with variations of that same grid for a while. Today, Ella rode Spi and from what I hear they did great. In other news, I just filled out the next entry form for Noble. He'll be making the move to Beginner Novice on Sunday, November 4th at the Walnut Creek Pony Club Horse Trials. So some people might chastize me for giving away a major highlight of my weekend in the blog title. I'm ok with that. 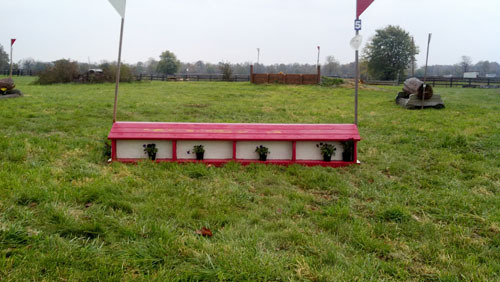 You can either assume we had a great weekend at the Come Again Farm Fall Horse Trial & Dressage Show (and you'd be right) or you can keep reading to find out ALL the details (because "Best. Score. Ever" is only part of it). The weekend started by hauling Noble to Hoosier Horse Park. I was asked to announce the stadium portion of their Combined Test (they being the Indiana Horse Council at their Octoberfest Charity Horse Show). Noble came because it made more sense to bring him along to Indiana, than to drive back and forth to get him. He just got to hang out in a stall while I was working. And work I did. Turns out the CT was being organized by H/J folks. I did a LOT of advising, suggesting and general helping out along with announcing. Everything from score running from dressage, to scoring dressage, scoring jumping, posting final scores, advising the organizer and even advising the jump judge (he was a Jumper judge and the rules are a LITTLE different for eventing). But all in all, it went really well. Didn't get out of there quite as early as I hoped and with the weather, plus a food/gas stop, we didn't arrive to CAF until dark. Thankfully, the farm is very easy to find. I've been friend with Lee Ann for many years but this is the first time I've made it to one of her shows. I went knowing that, because I know Lee Ann the way I do, the show was going to be fairly organized, run by the rules, and the courses would be appropriate with some challenges and safe. I was very much right and would go to any of her shows again in a heartbeat, as well as suggest them to others. Noble and I were entered in the 2'3" Starter division. We were one of 16 entries. My goal was to improve our showing over the Blue Grass Pony Club a few weeks ago. At home, Noble has been making big improvements and I was just hoping to show some of them. The boy did NOT disappoint! First, let me say that the wind was desperately looking for someone to carry back to Oz. WOW. I don't know exactly how gusty it was, but it was definitely blowing up some skirts. There were some horses that were NOT happy about the wind. Noble definitely showed his calm QH side with it and I was happy then and there. Dressage came first of course. We warmed up a bit in one of the 2 indoor arenas then went outside to walk a bit as we waited. They were running a few minutes late so we had 3 riders in front of us as we went out to the grass waiting area. No worries. Just kept him walking. Picked up the trot and did some trot/halt transitions as the horse in front of us was finishing. The test went very well I thought. I knew our walk wasn't up to par and I knew a couple of my circles weren't accurate. Oh and then there was a single buck that Noble opted for in the middle of our right canter circle. Silly boy. But as the judge pointed out, he came back and finished the canter with no issues. Walking out I was laughing at him but overall very happy with the performance and hoped for a decent score. When you're training a horse WITH someone else not to mention FOR someone else, there may not be any expectations... but I put expectations on myself. I know Anita has put a lot of time and work into Noble's training and I certainly don't want to disappoint her, or Jen. This time, I was successful. The judge agreed it was a nice test. We scored 6s on both the medium walk and free walk, a 6 on the canter (buck) circle and a 6 on submission in the collective marks. She gave us an *8* on the left canter transition and solid 7s for all other movements. Our score was a 32.0!! I should note that in 11 years of eventing with Char from Beginner Novice through CCI*, plus a couple events with Frankie and a few events with various other horses (Raz, Thumper, Stormy and now Noble), I have scored below a 40 ONCE.... in 2004 with Char at our final Training 3-day (one of the 2 judges gave us a 39.5). To be in the LOW 30's is a dream come true. On top of that, we were sitting in 5th place! Show Jumping was next after a very short break -- enough to change tack without feeling rushed but no real down time. Our warmup was sticky at best. Of course he didn't stop, but it wasn't pretty and I knew it. 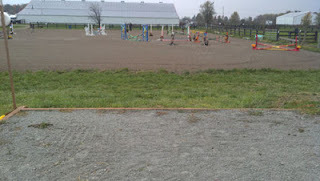 First time over the oxer, we came down on the back rail hard enough to break the plastic jump cup. He jumped it better the next time, but I still wasn't happy as I made my way to the arena. 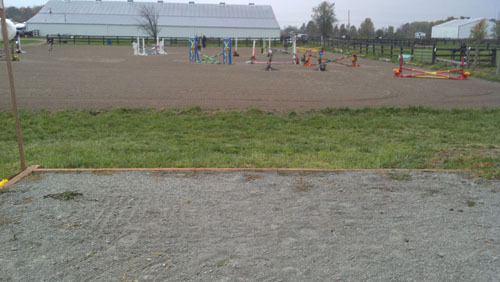 SJ was a little odd in that 7 of our 9 fences were grouped on one side of the arena. Gave the baby ponies a LOT to look at as we jumped through the course. But Noble did great... and got better and better as the round progressed. Double clear SJ meant we kept our 32.0 going into cross country and moved up to 4th place! The XC course was fantastic. Lee Ann has done a great job with it and it looked like a LOT of fun! 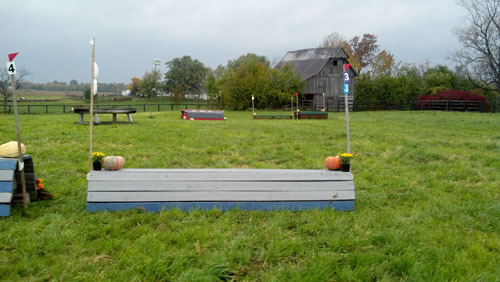 There wre a couple fences that I knew I was going to have to really RIDE -- including the blue rolltop at fence 3 and the "library" at fence 5. In addition, fence 6 was a bank. The approach was a ramp and then you had the option of a ramp down or a bank down. Noble has never seen a bank, but I was going to go for it (unless we had had major issues to that point). His attitude is such that I thought if I just told him to go, he'd peek at the drop and then hop off. If not, we'd collect our 20 points for the refusal and take the ramp, knowing it was something I would have to work on for the next time. View from the top of the Bank (Fence 6). The optional ramp is to the right. Stadium is obviously in front of us with the barns beyond that. We also had a Mandatory Flag at the water. It was placed so you could go through the water or around it but either way a stop wouldn't get penalized. With that in mind, the plan was that Noble WAS going to get his feet wet. Even if we wracked up a ton of time faults, he was going to go through the water. He'd schooled water once before so it shouldn't be THAT big of a deal. Warm up was awesome. We were out earlier than I would have liked, but just walked around for quite a while. Noble didn't seem to mine. 3 horses out, we picked up a trot and canter to warm up. 2 horses out we started jumping. It was a totally different warmup as he was almost pulling me to the fences. The Water. The Mandatory Flag is laying down in this pic. Plenty of room to "skirt" the water. Fence 8 is in the distance - far right. He was a rock star on course! He did look a bit at the blue rolltop at fence 3 as expected, but not nearly AS much of a look as I was prepared for. He didn't look hardly at all at the red roof cabin that was the "library" at fence 5. And the bank? You'd think he has been doing drop banks his entire life! Didn't slow to a trot as I expected, didn't peek as expected. He did jump out/off a bit bigger than needed, but if that's all I get, I'll take it! And he trotted through the water without issue. Even sped up a bit over the last 3 fences as I thought we were really down on time. He was flat out AMAZING! I thought we picked up 10 seconds of time faults. But they had us coming in 18 seconds under optimum and CLEAN!! Not only did we finish the event on a 32.0, but we finished 3rd!! Only 2 points out of 1st place. I can't be happier with his performance. I can't believe I forgot to post about this! On Friday, September 21st, a group of us from the barn drove down to Paris, Kentucky, to compete on Saturday in the title mini trial. We ended up with 5 competitors, 5 horses, 1 little brother, 5 parents, 1 car, 2 truck-trailers, 1 truck-camper, 1 tent and 1 trainer. Not sure if it was planned or not, but we were kind of stuck in the back of the barn. Actually that makes it sound worse that it was. It was fantastic. They mostly had competitors either from that barn or ship in so there weren't many overnight stalls and I think we had a fantastic spot. Nothing was very far away. I'll spare the boring details and just say that the farm is gorgeous, we couldn't have asked for better weather and the competition went wonderfully! I'm so glad we went and I was able to feel useful and help out quite a bit since Jen was still hobbling around. Noah and Remi competed in the 18" division. This is their first horse trial and they handled it beautifully. Finished in 3rd. Ashlyn and Star competed in the other 18" division. Also their first event and they did great. Star threw a couple things at Ashlyn and she made wonderful decisions. Finished 5th. Ella and Thumper were in the 2' division. I wasn't able to watch their cross country but did warm them up. They were VERY ready and from what I understand, got several compliments on her riding... though it was a bit faster than she needed to go. They did great and finished 2nd. Shelby and Sunday actually competed in both 2' divisions. I was a little concerned about their fitness as the cross country measured at over 1800 meters and was a bit hilly, but they handled it great. A first time error in stadium (circling between fences like you can on cross country) cost them a few points but didn't move their placing. They finished 2nd in that division and won the other (by 5 points in front of Ella and Thumper!). So that leaves how Noble and I did. Dressage was in a grass ring that wasn't QUITE level. He handled it fairly well. A couple of baby moments later in the test and we finished tied for 4th with a 42.5. Cross country was amazing for him! I couldn't be happier. He balked a bit at the first fence, but I kept him going and we hopped over it. Got a little wiggly at fence 2AB (an x to a very small log) but after that he was straight and answered every question. I measured the course but forgot to turn on my watch. Oh well. The division wasn't timed anyway. In stadium, he was a superstar again and left all the rails up (again, no timing). Unfortunately the scores from XC weren't posted before they handed out the final ribbons. I was a bit shocked to NOT hear them announce us in the placings. Talked to the TD (the lovely Carolyn Borgert) and it turns out they pinged us for a refusal at fence 1. I would have argued it had the scores been posted before stadium, but at that point, the final ribbons were given, the fence judges had left, and its not like we needed a qualifying score from it or something so I dropped it. The issue dropped us to a final score of 62.5 and in 9th place. In the strictest sence we did 5 of the 6, but really we did all 6. I couldn't be happier with his performance. I still don't believe we had a refusal at fence 1. I was more disappointed than I should have been that we didn't place. Yes the ribbons were cool, but really... they're just ribbons. Anita and I have put in a lot of time with Noble and he's really getting it. Guess I would have liked to have even a little something to show for it... to give back to Jen to thank her for the wonderful opportunity to work with such a nice pony. But, that event is over. It was a FANTASTIC learning experience and I think Noble really gained what he needed to -- experience. We're going to find out too as I have sent in an entry for the 2'3" Starter Division at the Come Again Farm Fall Horse Trial next weekend. We'll also be going alone as no one else from the barn can make it. I debated a LOT about going to this event as there are several other things going on that weekend, including my 25 year high school reunion and a clinic just down the road. In the end, I want to go to the event and I think doing another this close will give Noble the experience (and hopefully reinforce the good experience) that he needs. 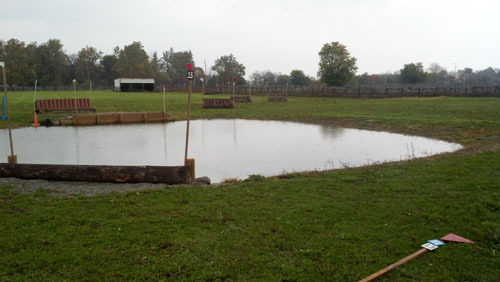 We're eyeing the Walnut Creek Pony Club horse trial as well but it's not til November and if the weather turns bad, that will be it til spring. So off we go! PS. I know I keep saying I'll post pictures. I promise I will. I don't have many that I take so I have to rely on the generosity of others to take and share pictures so I can post them. Some just made it up from the last few outtings so I'll try to get them up soon.